In a recent interview with Obviously influencer Wolf Turner, we discussed storytelling on social media, and what it takes to craft an engaging tale through either a single image or a video. We see tons of beautiful content on our projects, but each day it becomes more apparent that most successful posts tell a story. This doesn’t mean they have complete plots with a beginning, middle, and end (although they sometimes do). More often, they are entryways that allow the viewer to supply their own context. More to that point, they also don’t have to be videos. You can get a great deal across with a single image. As a storyteller myself, I am naturally drawn to content that is more than just a pretty picture. But it turns out that it’s not just people with an affinity for stories that are naturally drawn to this content. Stories give viewers something to talk about, which increases engagement. They’re also a great way to make sure your content sticks in your followers’ minds. Remember, they are scrolling through tons of attractive images every day. After a while, it all starts to blend together. But tell me a story and I’ll slow down and pay attention. I’ll give you a lot more of my mental time and energy. Here a few examples of how to tell a great story with a single image. 1) Create a sense of mystery. I love content that raises questions in my imagination. Where is Nathaniel Williams (@nathantrkt) going? Where is he coming from? Is he a visitor or is he at home? Is this his first time here, or has he been here many times before? While streetstyle shots like this are not uncommon, I particularly liked how he captured himself mid-motion, rather than posing, and in front of a building that was so striking. I imagine him entering those wide wooden doors and finding…. something…. awe-inspiring waiting inside. To be honest, this post sent me on a bit of a sleuthing quest to find out what this building is. It’s The Christuskirche in Mannheim Germany, in case you were curious. How’s that for engagement? 2) Capture a relatable moment. I love this adorable image from Destiny Kohlman (@destinykohlman). We see the precise moment where her little girl tasted something yummy and is about to smile. It’s so simple, but we can see it unfolding ahead of us, and it calls to mind the little ones in our lives. 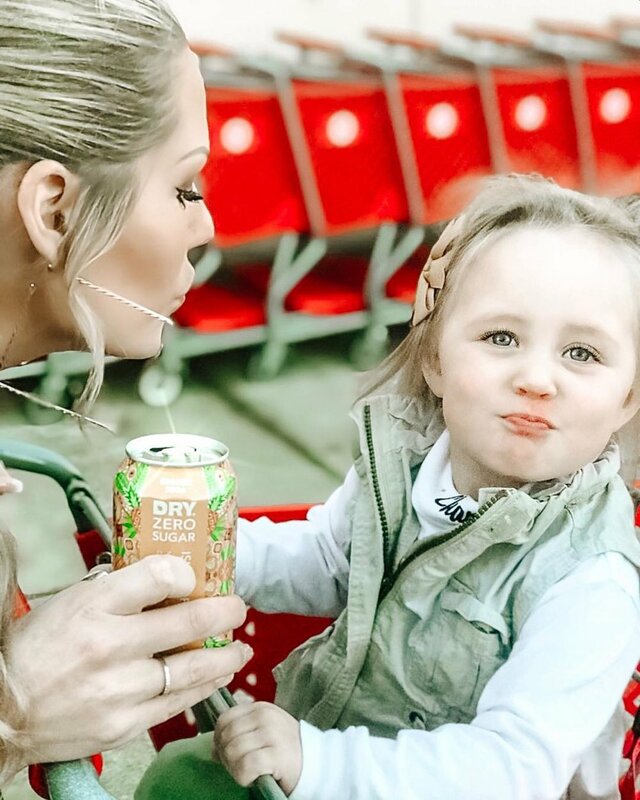 She looks mischievous, like she’s pulled one over on her mama, but we know- from both the caption and the label on the can- that it is in fact Mom who has the upper hand. There’s nothing overly complex about the story being told here, just a simple moment in time that we can all see and relate to. And aren’t those the most precious moments of all? 3) Don’t fear the long caption. Sometimes the best way to tell a story is to just… tell it. Meg Wallace (@megmariewallace) is a master of the long caption, which is a great way to make yourself vulnerable and reveal a little more about yourself. For this post for Molekule Air she describes her family’s struggle with allergies and explains how the product actively improved their lives in a concrete way. It’s much more effective than just a basic product shot, which doesn’t really tell us anything about the person posting it. She is also unafraid to talk about the nitty gritty of life- pregnancy, sick kids, ect- that might not always be as flawless as her (absolutely gorgeous) lifestyle photos. Revelatory captions are a great way to allow your followers to peak into your life and remind them that, yes, you’re real person with a story to tell. This is far from an extensive list of ways to tell great stories on your social feed, but it’s an important reminder that social media isn’t all about capturing that perfect shot. High quality content is a carefully balanced combination of aesthetic and heart. And if these awesome Obviously influencers can do it, you certainly can too! How do you tell stories on social media? Share your tips with us in the comments!